A conference on “Commercial Mediation and Dispute System Design” has been held in Baku. 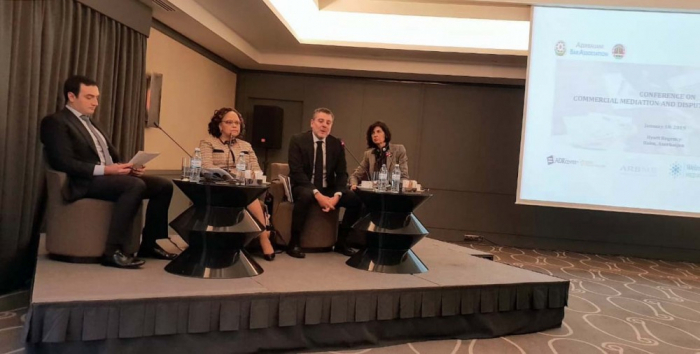 The event was held with the administrative support of the Azerbaijani Bar Association (ABA) and information support of American Chamber of Commerce in Azerbaijan (AmCham). More than 40 members of the ABA, foreign experts and attorneys working in various private enterprises attended the conference. CEO of Alternative Dispute Resolution (ADR) Leonardo D’Urso (Italy), head of the Department of Entrepreneurship Law at St. Louis University, USA, professor Patricia Li, US attorney (JAMS) Lizbeth Hasse and chairman of ADR Committee of the Azerbaijani Bar Association and ArbMe Dispute Resolution (Azerbaijan) Ruslan Mirzayev delivered speeches at the event. The conference continued with panel sessions. The panelists included mediators and dispute resolution experts from the largest dispute resolution centers operating in the United States of America and Europe. The conference which consisted of 2 sessions is designed for business people to explore how they may benefit, manage their risks and reduce their expenses by resolving their commercial and corporate disputes in mediation and by implementing an efficient dispute resolution system within their companies. During the sessions, the panelists discussed the role of attorneys during mediation process and whether it is a threat for legal profession. ArbMe Dispute Resolution is an independent dispute resolution services provider. Its mission is to provide business community with effective and efficient dispute resolution mechanisms and help them to solve their disputes without recourse to lengthy litigation proceedings. ArbMe Dispute Resolution provides mediation, arbitration, dispute system design, early neutral evaluation, corporate conflict coaching and corporate dispute resolution facilitation services.